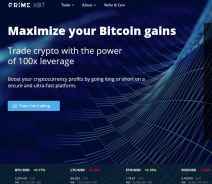 PrimeXBT is a Bitcoin-based online platform that offers leveraged trading on several cryptocurrencies, including Bitcoin, Ethereum, Ripple and Litecoin. The website is owned and operated by Prime XBT Trading Services Ltd. a company incorporated in the Republic of Seychelles with company number 206865. Their trading platform seems buggy and in some cases, it wouldn’t load at all. Using Firefox it wouldn’t load no matter how many times I tried and using the Brave browser I got it to work once. It remained active for a few good hours, but once I logged out I couldn’t get back in. As a note: I am talking about the trading platform itself (charts, orders, etc.). The other sections of the platform worked fine. I am sure it’s something they will fix, but better do it ASAP if they want any traders there. 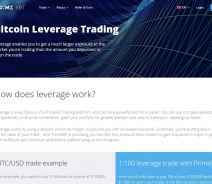 You can trade Bitcoin and a few other digital assets with leverage up to 100x, which is HUGE considering that the usual leverage offered by CFD brokers is about 5x (I’ve seen 20x but this was on a very few occasions). Another great thing is that you don’t need to go through any KYC verification. No proof of residence, no selfies with your passport – just enter your email, choose a password and you can deposit, trade and withdraw. The owning company is not regulated but according to the information found at the bottom of their website, they are “in the process of undertaking a legal and regulatory analysis of Bitcoin trading with margin”. It is unclear what that means exactly but seems they are looking to get regulated. Despite not being regulated, this doesn’t look like a scam and keep in mind that a lot of cryptocurrency exchanges are not supervised by a major financial watchdog simply because crypto, in general, is mostly unregulated. However, you should always use caution because this is a new broker and we cannot vouch for their integrity. Notice! : This Broker has been rated average by our Staff. Start your trading career with a Top Rated Broker Now!. Should I Open An Account With PrimeXBT? This trading venue is a mix between a crypto exchange and a crypto CFD broker but I am inclined to consider them exchange rather than a broker. However, there’s no trace of an order book or market depth, which prevents me from calling them a full-on exchange. But let’s not bother with semantics anymore and see what they have to offer. Although I had some problems with their platform, when I managed to get it to work it was actually pretty good, with intuitive menus and info that was easy to access. It’s proprietary and web-based, with no option to download a desktop version. The order types are the usual: Market, Limit, Stop and Protection orders. The latter type includes Stop Loss, Take Profit and GTC (good till canceled) orders. To start trading, clients will need to deposit and this can be done using only Bitcoin (minimum 0.001 BTC). It’s an inconvenience if you don’t have any Bitcoin but PrimeXBT offers Changelly as a widget. Using it you can purchase Bitcoin with your credit card (or swap another cryptocurrency to Bitcoin) and then deposit it directly into your PrimeXBT account. There’s not much in terms of “classic” education meaning that you won’t find articles about what is Bitcoin, how to trade it or any history lessons. What you will get instead are good tutorials about how to use their platform and explanations about leverage, margin and trade orders. Overall PrimeXBT seems like a good choice for anyone who understands the risks and advantages of high leverage and doesn’t want to go through the KYC hassle. I liked the platform but I couldn’t get it to work all the time, which could be a deal-breaker if it’s not addressed quickly. Other downsides are the lack of regulation (but that’s the case with most crypto exchanges) and the very short time in business. If you want to open an account just make sure you don’t deposit large sums right away. Give it some time. At the time of writing we couldn’t locate any type of user complaints against PrimeXBT and this is most likely due to their low profile and limited online presence. They need to grow their service and their popularity but once that happens, we will surely see more clients talking about them and reviewing their offering. Both withdrawals and deposits can be made using Bitcoin only (fiat and other cryptocurrencies are not accepted). To tackle this inconvenient, PrimeXBT integrated Changelly, which allows users to buy Bitcoin using credit cards. Withdrawals don’t incur a fee charged by PrimeXBT but you will pay the normal network fee for the BTC transaction. The minimum sum allowed is not specified but it should be similar to deposits (0.001 BTC). Withdrawals are processed once a day, between 12:00 and 13:00 UTC. The time it takes depends on network clutter but if the sum is a significant one, 12 hours may pass because PrimeXBT employees will have to manually refund the hot wallet (only small amounts are held in online hot wallets and the rest is in cold offline wallets, which is actually a good thing for security). Definitely, the elephant in the room is the 100x leverage which is the highest we’ve seen to date. You should know that leverage can greatly increase profits but it’s also a very sharp double-edged sword because it drastically increases risk as well. The website is translated into 6 languages, is well organized, without too much marketing material and enough information to get you started. However, their platform is a hit and miss, working only at times (at least for me). Mobile platforms are not available at the moment but according to some sources, PrimeXBT will soon release Android and iOS versions. The number of assets is very limited, with only 5 choices: Bitcoin, Ethereum, Litecoin, EOS and Ripple’s XRP. The spreads are very tight, with only 2 USD on BTC/USD and less than 1 USD on ETH/USD. Keep in mind that spreads are floating so in volatile times they will widen. Leverage is 100x for all 5 cryptocurrencies. PrimeXBT charges two types of fees: trading fees (0.05% per trade) and overnight fees ($5.74 per 1 BTC, $0.21 per 1 ETH, etc.). The overnight fee will not be paid if the trade is opened and closed within the same day. Support is only available through email, which is a downside because you won’t get your problem solved instantly. Bitcoin is the only accepted method for both deposits and withdrawals. The duration depends on network confirmation but keeps in mind that PrimeXBT processes all withdrawals only once a day, between 12:00 and 13:00 UTC so it will probably take longer than a normal BTC transaction. Huge leverage that can be a double-edged sword and no account verification (the client doesn’t have to go through KYC procedure).